Drivers of vehicles with tanks and certain tank components, and some drivers of vehicles carrying dangerous goods in packages must hold a vocational certificate of training known as ADR. ADR (Accord Dangereux Routier) formally, the European Agreement concerning the International Carriage of Dangerous Goods by Road (ADR) is a 1957 United Nations treaty that governs transnational transport of hazardous materials. All drivers of vehicles carrying dangerous goods must attend an approved basic training course. are aware of the hazards in the carriage of dangerous goods. can take steps to reduce the likelihood of an incident taking place. can take all the necessary measures for their own safety and that of the public and the environment, to limit the effects of any incident that does occur. have individual practical experience of the actions they will need to take. 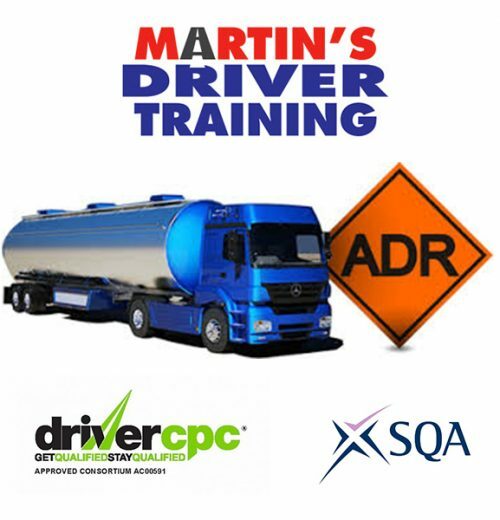 At Martin’s Driver Training we offer courses in all categories of hazardous goods with the exception of explosives and radioactives. Our instructor will ensure that the course is informative, but also fun; to ensure that you get the best from the course. The course is classroom based, with lectures and practical exercises. In order to get your ADR certificate and ADR card you will need to sit a number of exams, during the course. The exams are multiple choice and are conducted online. The exam results will be available at the end of your course or on the following day, so there is no need to wait weeks for your exam results or your ADR card. Please be aware that the training and tests can only be conducted in the English language. The course is also eligible for CPC credits, so 3 days CPC credits will be awarded for attending. The course is also eligible for CPC credits, so 4 days CPC credits will be awarded for attending. Vehicle Operations – compliance, documentation, equipment, PPE, tunnels, parking, small load limits, loading and unloading, accidents and terrorism measures. The course is a classroom course using visual presentations, theoretical examples, practical demonstrations and/or participation. Candidates will receive a certificate upon successful completion of the course. There are no scheduled courses at present. Please let us know if you need to book a course and we will schedule a day.